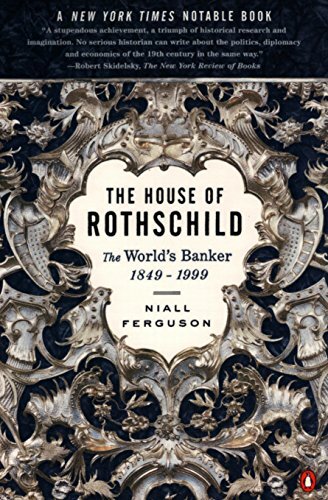 This second volume of Niall Ferguson's acclaimed, landmark history of the legendary Rothschild banking dynasty concludes his myth-breaking portrait of one of the most powerful and fascinating families of modern times. With all the depth, clarity and drama with which he traced the Rothschild's ascent, Ferguson shows how their power waned as conflicts from Crimea to the Second World War repeatedly threatened the stability of their worldwide empire, and how their failure to establish themselves successfully in the United States would prove fateful. At once a classic family saga and a major work of economic, social and political history, this is the definitive biography of some of the most powerful financiers of recent times. For nearly 200 years, the famed Rothschild banking family has weathered political revolutions, world wars and international financial crises. The House of Rothschild chronicles the family's rise and fall, and now its rise again, and describes the reasons for its lasting power. "Part of the secret of long-run success in banking is, of course, not to go bust; the Rothschilds' relative risk aversion is one reason for their financial longevity," writes author Niall Ferguson, who was surprised to discover during his research that the family had a return on capital as low as an average 3.9 percent from 1900-1909.